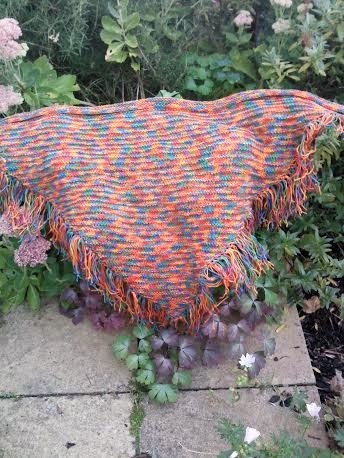 Here is the completed Garter Stripe Shawl that I started on September 1st and completed today the 7th September. I made it as part of the September Stash buster Challenge on a Sparkpeople team that I belong to. A total of 765 yards was used I cannot say that you would use that amount of yarn as you may need more depending on the yarn you use and hoe tight you knit. I am told it makes a difference so use the yardage a a rough guide. Personally I always get more than I need that way I do not run out and the extra yarn is always useful for other projects. 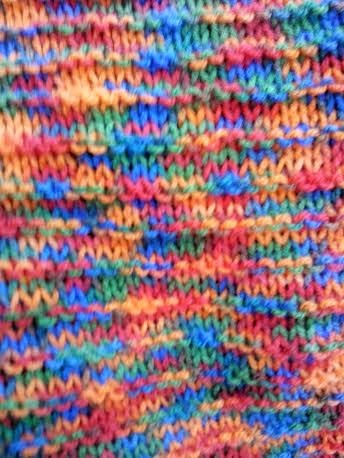 This picture shows the garter rib effect and the colours show up nicely as well. Repeat these 4 rows until the shawl is as big as you want it leaving plenty of yarn to do the last 3 rows of K1 YO Knit to the end of each row. Bind Off. 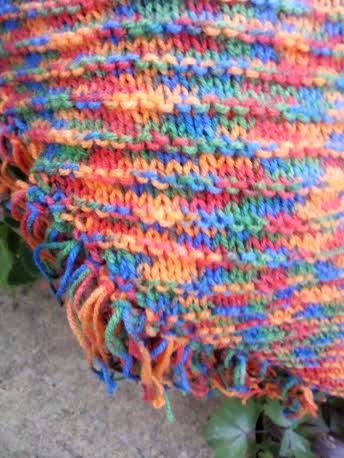 I added a fringe and knotted each single piece of yarn of the fringe to help it from fraying too much when it is washed. The shawl measures 26 inches from point to top of the shawl and 45 inches across so a small shawl that would be suitable for someone sat in a chair or in bed. I am hoping that SIBOL will be able to use it, they did not mention if the shawls were to have a fringe or not. If they cannot use it I will pass it onto someone else I am sure someone will want it if SIBOL cannot use it. Now I need a new project for the September Stash buster Challenge and will sort one out so I can get it started tomorrow night. I love the yarn and your pattern is so easy but pretty. I'm sure it would be welcome at SIBOL. The Shawl is perfect please dont worry. I love the stitch, colour of the yarn and I'm sure the fringes will be fine. I'm ever so grateful to you Paula and I know the Home will be.